The fall of oil prices has left its footprint on gas prices, particularly in Asia, and to a lesser extent in Europe. Gas prices are now converging at a lower level. Atradius expects strong supply from new Australian LNG facilities and upcoming US exports to cause Asian prices to recover only gradually until 2020. US exports are expected to underpin a slow US price recovery. It is anticipated that Europe will face a supply deficit. Upward pressure on prices will be only partially relieved by LNG imports. Russia remains its largest gas provider. In our July 2014 Outlook we have provided an in-depth study of the gas market. This market has, as we argued, strong regional characteristics. In fact gas markets in Asia, Europe and the United States are increasingly interlinked. We highlighted the, perhaps surprising, dynamism of the gas market, or gas markets, for that matter. Such dynamism has left its footprint again since our July Outlook. Gas prices have fallen significantly in all markets and regions, and remain under pressure. In this Research Note we will unveil the factors that underlie this development. We will also provide an outlook on gas prices, inevitably a revised one compared to that of July 2014. Uncertainty has risen, with environmental issues more pressing now that countries have become aware of the need to reduce CO2 emissions. 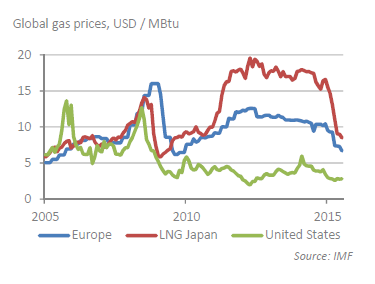 The dynamism in the gas market since July 2014 is broadly based on three factors. First and foremost, with the spectacular fall of the oil price from USD 120 per barrel Brent to around USD 50 during the second half of 2014, gas prices have declined as well. Although oil and gas are not substitutes for each other, gas prices are linked to oil prices, particularly in Asia and to a lesser extent in Europe. Second, other global gas market specific factors played a role. Demand was markedly lower than expected. The low cost of coal and the sharp fall in the cost of renewable energy made gas a less attractive energy production source for the energy sector. And it is precisely the energy sector in which gas is predominantly used. Finally, supply was higher than expected, especially the shale supply in the United States, which was maintained despite severe pressure on US prices. The latter, notably, are determined by supply and demand rather than the oil price as we documented in our July 2014 Outlook. Therefore, the oil price and gas market specific demand and supply factors have (re)shaped the gas market, and during a very brief period. Despite lower gas prices, production in the US is still increasing: 5.7% growth in 2014, a trend that has continued in early 2015. Faced with lower profits, the US oil and gas sector, has lowered costs significantly. For example, service costs were reduced by 15%, a process that is likely to continue. For the time being, production growth has been upheld. Still, it is likely that it will slow at current price levels of (significantly) below USD 3 per MBtu. A number of firms will simply not be able to produce cost effectively at this price level in the long run. On the demand side, lower gas prices have induced mild consumption growth, at around 2% in 2014. Even that low growth rate is under pressure for the period up to 2020. The energy sector has substituted coal for (much cheaper) gas over the past couple of years as gas prices went below coal prices. With that incentive now waning, environmental issues are forecast to take over to keep the substitution process up, all be it at a slower pace. The US government plans to reduce its emissions by 26% to 28% by 2030, relative to a 2005 baseline. 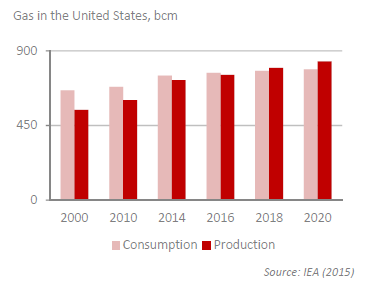 Production, however, is expected to grow at an annual rate twice as high as consumption for the period up to 2020. The result of this oversupply should be a sharp increase of US exports. The most likely destination is Asia. Prices in Asia have fallen sharply, but current levels are still beneficial for US exports taking into account the (fixed) LNG costs of around USD 4 per MBtu. Moreover, Asian prices are expected to stabilize. A portion of US exports will find its way to Europe, where LNG imports are expected to double. As a result of oversupply and increased exports, Henry Hub prices are expected to remain under pressure but to increase somewhat. In essence, though, the picture for the US has not changed much since our previous outlook. No major shock has occurred. The conflict between Russia and Ukraine escalated in 2014. With Ukraine seeking closer connections with Europe and the latter imposing sanctions on Russia, European gas supply relationships are at stake. Ukraine is the (pipeline) main transit country for gas to Europe. Becoming less dependent on Russian gas has quickly become a European priority. Earlier this year, the Energy Union Framework Strategy was launched by the European Commission. Unsurprisingly, its main pillars are diversification of gas suppliers and improving the gas infrastructure. European gas consumption has been weak due to competition from coal as an input for electricity generation, suppressed economic growth, improved efficiency and the use of renewable energy. In 2014 European gas consumption fell by 4.8%, a figure accentuated by the mild winter. The consumption outlook is weak while some recovery from the extraordinary low levels of 2014 is expected. Environmental concerns will also help. In the energy sector, coal will gradually be replaced by gas as outdated coal plants will be closed under the EU Large Combustion Plant Directive. Other measures may follow as part of the objective to reduce C02 emissions by 30% compared to 1990. Meanwhile, production will be under pressure as well. At the root of this is depressed production in the United Kingdom, Norway and the Netherlands. In Norway investments were postponed simply because of the low prices. Safety reasons (risk of earthquakes) triggered a production limitation in the Netherlands, for at least 2015 and 2016. 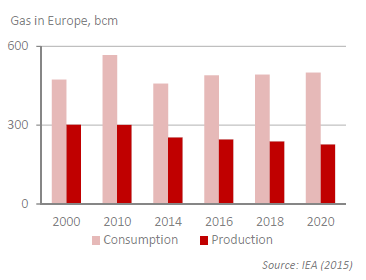 A Shale Gas revolution similar to that of the US is unlikely to occur in Europe. Apart from the difference between the entrepreneurial and financial climate in Europe, environmental concerns play a major role. The picture of declining production and some upward pressure on consumption in Europe implies higher import needs. This will increasingly be provided by LNG. For the latter there are two triggers. We have already mentioned the geopolitical incentive. Moreover, as LNG prices have declined, there is also an economic argument. LNG will be in ample supply as, apart from US exports, LNG facilities in Australia will come on stream. European infrastructure is expected to be able to accommodate this increase in imports as LNG facilities are added and countries are well connected through pipelines. Despite that, Russia remains an important supplier, barring further political shocks. It is simply by far the largest producer in the region, capable of accelerating production at short notice and has the largest reserves as well. But it has to be careful with its European clients. Russia will also have to deal with the increasing pressure on the oil-indexed pricing mechanism that we have already signalled in the July 2014 Outlook. Infrastructure expansion will facilitate this, pushing for more short-term contracts based on spot prices. The European gas market is rapidly changing. The Asian market is also changing and can be characterised by three developments: slowing consumption growth, especially in China, strong supply of LNG as Australian projects come on stream and the much lower oil price. These factors put pressure on Asian gas prices. As opposed to previous years, 2014 showed low consumption growth - the lowest since 1981. This can be largely linked to the slowdown in gas consumption growth in China. Moreover, Japan decided to re-launch nuclear reactors. This switch (back) from gas to nuclear energy is a result of the relatively high costs of gas in Asia. In South Korea, another major LNG importer, consumption fell sharply as power plants shifted to cheaper coal as input. With the temporary factors in Japan and South Korea, fading Asian consumption growth is expected to rebound, building on China, whose gas consumption is expected to increase by 10% per annum. The Chinese authorities have recently declared ‘War on pollution’, which in addition to other things, attempts to limit the use of coal. Gas is a clean energy source and is therefore expected to take advantage of the measures, just like renewables. Lower LNG prices will also help to push up the currently low share of gas in the energy mix. Still, with the expected consumption growth level being clear, and high, the forecasts carry an unusual amount of uncertainty. 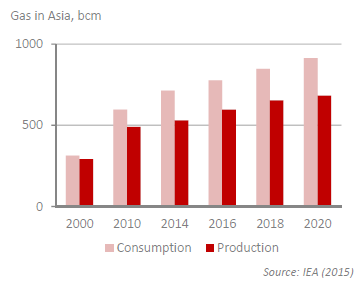 On the supply side, Chinese production of gas faces setbacks, with shale gas production, in particular, struggling to pick up momentum; the authorities have already more than halved the 2020 shale output target. Production growth is to come from conventional plays, and expected to hover around 5.5%, implying that China’s supply deficit will grow. This is a picture that holds for the rest of Asia as well, as production is expected to grow only by 1% per annum. Production growth in Malaysia and, particularly, Indonesia will be insufficient to meet consumption growth. The supply deficit will be primarily addressed by LNG from Australia, a country set to become a gas giant with production growth of more than 10%. As a result, the currently dominant position of Qatar in Asia is set to weaken. The impact of lower oil prices is evident in this region since LNG is based on the oil price. 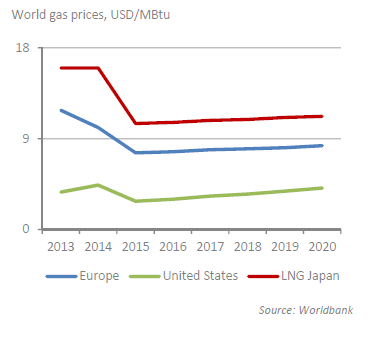 The price of LNG in Japan is expected to remain around USD 10.5 per MBtu, significantly lower than in 2014, when prices stood at USD 17.51 per MBtu LNG. The current price of LNG is too low to cover the cost of construction of a new LNG facility. Still, LNG facilities that are currently under construction will be taken into operation. This will lead to oversupply of LNG plants and will keep pressure on prices. Such pressure should fade over time. Still, current low prices carry the risk that (LNG) investment decisions will be postponed, and supply is expected to be tighter around 2020. Asia may then pay a price for the oil link. The developments in Asia will be pivotal for gas prices, and not just in that region. With LNG supply abound, from Australia, and – most likely – the United States, price pressure in the Asian region is set to continue. Still, demand is forecast to remain strong, especially from China. The oil price is expected to recover as well, albeit gradually. This implies a slightly improving Asian gas price level, to somewhat higher than USD 11 per MBtu in 2020. LNG will also find its way to Europe, where it provides an alternative source of supply to Russian pipeline gas, addressing security needs. The negotiation position with Russia should thus improve; keeping prices from rising more than gradually, despite the increasing import needs: from USD 7.6 per MBtu in 2015 to USD 8.3 per MBtu in 2020. In the US increasing exports should exert upward pressure on the Henry Hub price, from an average of USD 2.8 per MBtu in 2015 to USD 4.1 per MBtu in 2020. The overall picture is then a convergence of global gas prices, a process that we detected in our July 2014 Outlook. Despite the now lower gas levels, especially in Asia, convergence has not reached its limits. The difference between the gas prices in Asia and the US is expected to narrow to USD 7 per MBtu in 2020, from USD 7.7 per MBtu this year. Since the additional cost of LNG is around USD 4 per MBtu price convergence is not expected to stop in 2020.